Hello everyone, dates are going fast! 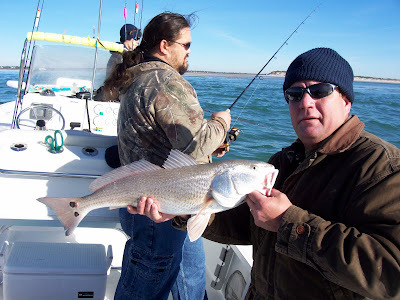 Availability aboard FISH'N4LIFE with myself and aboard TAYLOR'MADE with Capt. 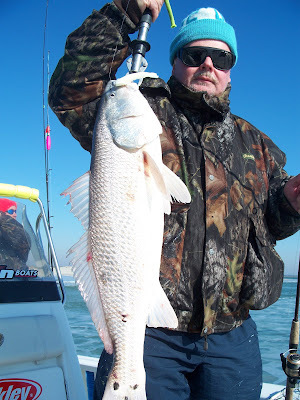 Mike Taylor for Extreme Sightcasting at Winter Reds, as shown in our Cover Article "Crystal Blue Persuasion" in the Feb. issue of the NC Sportsman Magazine, are going fast. 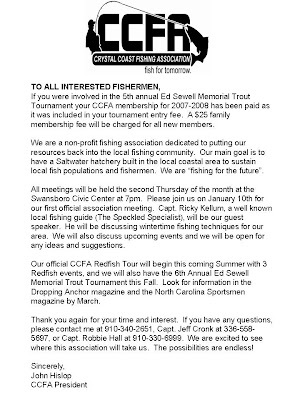 This fishery lasts thru April. Then, many of these large schools of fish move into the backwaters. 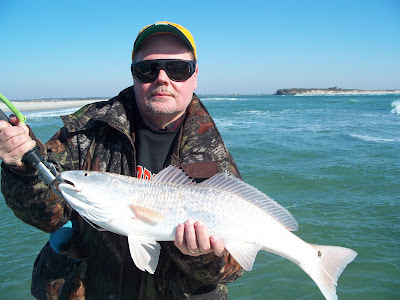 Don't miss out on some of the best Redfishing on the East Coast of NC, heck... the US. 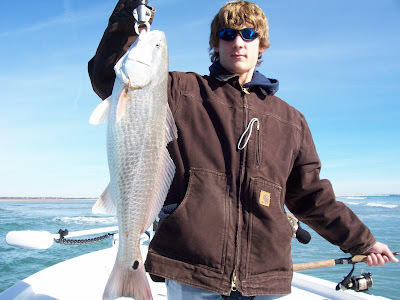 With the average school of fish consisting of 1000 to 5000 redfish its common to land 25 to 100 redfish in a single trip. Mike and I have spent over 20yrs targeting these wintering schools of fish and the no. 's of fish are at an all time high. 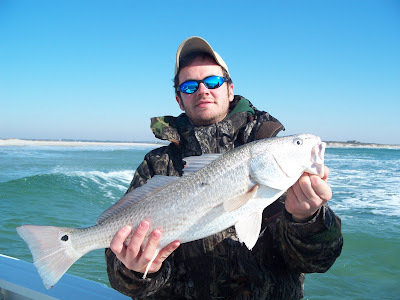 This can be some of the most exhilirating, heart-pounding fishing along the coast. Don't miss out. Winter's not over yet! Thanks for all your support and I hope to have Capt. Mike joining us here on the site this year. 1/27/08 EXCELLENT DAY! Redfish and Trout! 1/21/08 COOOOLD! Trout and Redfish! Yikes! What a frigid morning. It was 20 degrees and a blowin with a wind chill in the low teens. everywhere I stopped this morning folks said, You aren't going fish'n are you? Yeah, there's a reason my business is called FISH'N4LIFE. 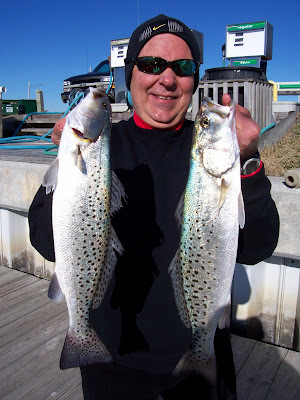 With ice in the boat and Bobby P. onboard, we eased out behind the barrier islands to see if a few trout would bite. 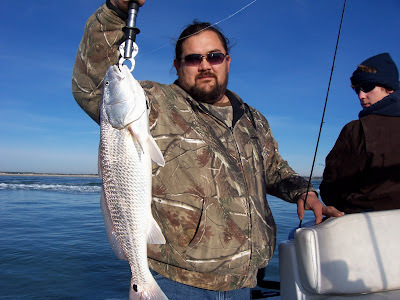 Bobby hooked up a decent redfish and several trout, a solid 2lbs. 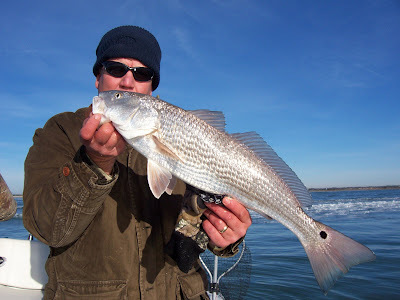 each, then we moved out into the surf zone to scout out the redfish. Go figure, the weatherman was off a little as the winds were more than 10mph and already out of the ENE just after daybreak. Well, we scoured the murky surf and finally located a school of several hundred reds. We worked them a short while and only had a few hook-ups. These fish had a case of the lockjaw! Anyway, with worsening conditions we opted to head into the backwaters where we managed to find some 17 to 19in. puppydrum to play with. Not too shabby of a morning for the extreme cold temps. 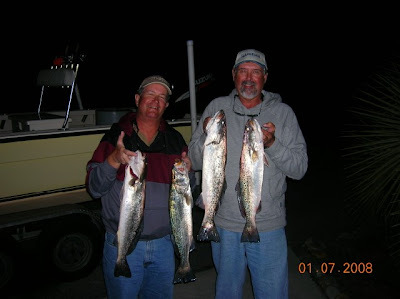 Great job on the trout and reds Bobby. Triton 240LTS Bayboat FORSALE! Awsome Deal! PICTURES BELOW..... CALL ME AT 336-558-5697 TO INQUIRE! Hello Everyone! I know I've had several of you ask me to let you know when I was ready to put my boat up forsale. The 2008 (same hull design)rigged as mine is going $60,000. The NADA value on my 2006 package is currently $43,000 which doesn't include the new $1500 Trolling Motor or other extras. This package is valued at $45,000. I'm only asking $35,000. Someone will be getting an awsome deal on a very clean, fast (51mph on GPS), dependable, versatile, boat! GPS going with it includes every Flounder Hole out of Bogue Inlet! over 400 numbers. CALL ME ASAP AT 336-558-5697 TO INQUIRE! 2006 Mercury 225XL Optimax (best 2 stroke fuel economy) Still Under Warranty! EXTRAS: 4 Gunnel Mnt. S/S Trolling Rod Holders, 4 Surface Mnt. S/S Low Profile Rod Holders, Compass, S/S Hydraulic Trim Tabs, Stern Bench Seat w/ Backrest, 3 Bank 10amp Onboard Charging System w/Fixed Receptacle, 60 Gallon and 25 Gallon Live Well w/Recirculation System. Aluminum Swim Ladder w/ S/S Bracket, 3 New Deep Cycle Marine Batteries, Courtesy Lights, Navigational Lights, New Rechargable Spotlight, Fire Exstinguisher, Flares, 4 Life Vests, Throwable Cushion. Folks, this boat is in great condition. I kept this boat very clean. All service has been done through Boats Unlimited in New Bern. The motor has approximately 500hrs and has just underwent a complete check and tune on 1/18/08. The Factory Warranty on the Outboard is good through November 2008 with the option to add up to 3 more years Factory Warranty. A new Stainless Steel Prop was just installed. The lights and wiring on the trailer have just been replaced on 1/1/08. The bearings were replaced in Summer of 2007 and there are Bearing Buddies on all 4 tires. The NADA Average Retail Price for this 2006 model boat, motor, trailer package is currently $43,000 which doesn't include the new $1500 trolling motor or most of the extras. The few that are available on the Market are going for $40K to $43K. I'm ordering my new one and this boat must go... I'm only asking $35,000 Firm for this boat. It's worth well more than that. It is one of the most comfortable, fastest, dryest rides on the water. You can easily fish 12in. of water or run 30miles offshore in this vessel. If you want to talk with some folks running one of these boats here's a few no. 's John Hislop 910-340-2651, Tom Burton 919-612-0619, Dion Lynn 910-546-0846. Sun. Jan. 20th Bad Weather! Great Redfish Bite! Well, I almost don't want to put this post up.... since I convinced my crew for today not to come down to the coast due to the weather... Well here it is... The Holcomb crew was going to journy down the Swansboro from North of Charlotte to attempt some extreme Redfish'n. But that blasted Radar looked like heck Sat. Night and the weatherman kept calling for lots of snow between Charlotte and the Coast. Then the forecast for today in Swansboro was 20-25mph winds with temps not getting over 36degrees... So, in the best interest of my clients, I suggested we rebook. So, I went scouting by myself for a couple hours today and wound up Wearing my right arm out fighting redfish ranging from 25 to 32in. Despite the 25mph winds I was lucky enough to locate 2 massive schools of redfish. Each school with several thousand fish or more. 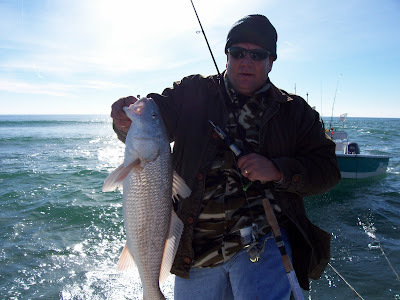 I worked them for several hours and landed about 35 redfish all in the upper slot or over the slot. Despite the cold temps they were feeding pretty well. Hopefully, we'll be able to locate these schools again tommorrow with regular client Bobbie P. onboard. Hello Everyone. Just wanted to take a minute to let you know my home phone has changed. 910-326-7512 no longer exists.... my new home telephone no. is 252-764-2174 . Changes to the website are coming... but I know if you guys are like me... you pay more attention to fishing reports and pictures than the charter info. on the other page. 1/7/08 WOW! 10 Citation Trout! well, I wasn't able to go today but i gave a load of my trout candy to good friend Capt. Jim Davis and he went after the trout with a vengence. Jim gave me a call after working out along the beach most of the day. He wound up landing over 20 nice sized trout and had 10 trout that would weigh in as citations! That is extraordinary for January fishing! Great job Jim, Now the tough part is dealing with all your buddies that will be calling for the coordinates! Ha Ha! Jan. 5th EXTREME REDFISHING! Thousands of Redfish! CHECK OUT THIS SCHOOL OF REDS RIDING THE WAVE INTO US! Click on the pic to enlarge it. Well, You would of thought it impossible to get a fish to bite this Sat. morning after three nights of below freezing temperatures, and 22 degrees as we pulled away from the dock. The backwaters fell from 59 degrees to 44 degrees in 4 days.. While the ocean dropped from 58 to 50. This type of condition is usually prime for setting us up with an Extreme Redfishing Trip! That's exactly what happened. 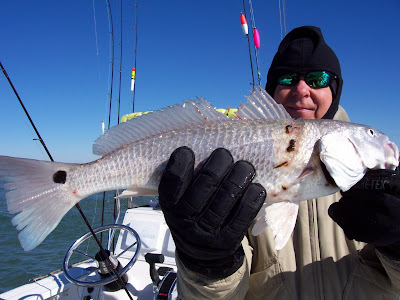 The quick drop in water temps in the backwaters flushed the majority of the Redfish into the surfzone. With Tom Ridgway and his crew onboard, we headed out to find a school of these reds. About 10min. 's into it and we located a big school of 30+in. fish We tryed over and over to stay on these fish but they were very mobile and working a very dangerous shoal stacked up with big swell. We hooked up a couple and decided to move on a find some fish that were more easily accessible. We covered about 3miles of shoals and then we hit the mother load! We found a school of Redfish that was probably 200yards long and 50ft wide... There were probably upwards of 8,000 to 10,000 fish in this school. These fish ranged from 22in. to 30in. We began with constant hook-ups and followed these fish for a while. They eventually broke up into several schools and we took adavantage of several thousand fish that parked themselves on a shallow shoal. We anchored down and again began with constant catch and releases. These fish would continually ride the swell into the shoal and our boat, then swim back off. At one point, several 10ft porpoises decided they wanted a Redfish Sandwich... when they came in on a swell and dive bombed the school of reds in 2ft of water within 20ft of the boat. We caught reds until our arms were wore out! 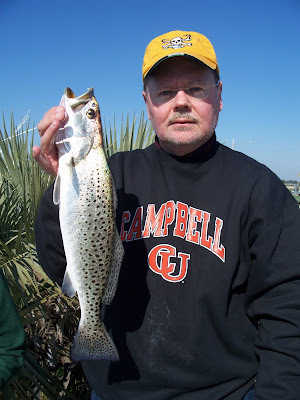 Then, to top it off, we went into the backwaters hoping to get on a few speckled trout... Instead, we located a school of 24 to 28in. Redfish in some shallow water and boated another 20 fish in about an hour. We headed back to the dock around 1:30pm absolutely satisfied with the awsome bite we were blessed with today! 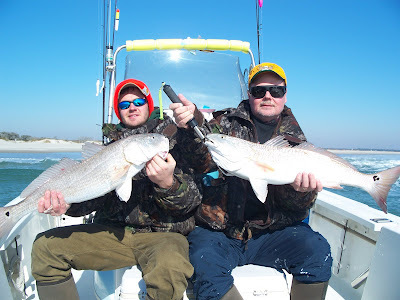 We probably landed close to 100 Redfish with the largest at 10lbs and 9 spots being the most on any fish today! Great job guys! Sat.5th now Booked/ Sun. morning 4hr Redfish/Trout still open! Folks, I just had this weekend come available. A client had a member of their family pass away and won't be able to make the trip to the coast. Joel, God Bless and Best wishes to you and your loved ones. I'll see you guys in the near future. The Following Dates are currently open as of 11am on Jan. 3rd. 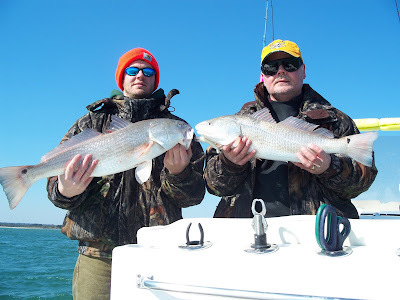 The cold weather this week will set things up for a great Redfish Sightcasting trip here out of Swansboro this weekend... and some good trout fishing and maybe Striper fishing out of Morehead City. I know several clients originally inquired about this weekend. If it still works with your schedule, give me a shout and let's go catch some fish! 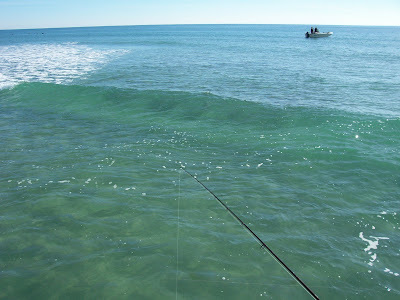 The club website is www.crystalcoastfishing.net and is already up and running. More info. will be placed on the site as the club progresses. Dec. 29th- With Mike Collins crew on this morning, we set out with a forecast of steady rain and a SW blow looking for some trout and reds. We probably should've stayed at the dock but we were too gung ho... We put our time in... over 8 hrs. today with not too much to show for it. 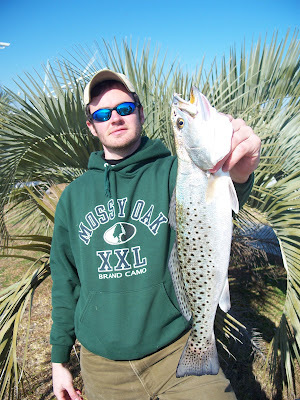 we landed just a couple of small puppydrum and about 2 dozen speckled trout with 7 that were able to keep. Very little reward for a lot of work today. Hopefully the weather clears up soon as there are some good schools of redfish and trout waiting to be had.